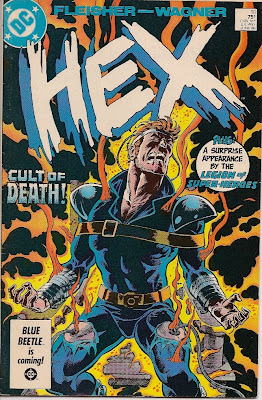 Matching Dragoons: Hex #10 "The Sin Killers"
Hex #10 "The Sin Killers"
Our story starts some undefined time after last issue with a wonderful bird's eye view of a 'house of ill repute' and we see a car pull up and several people with guns piling out. We here Jonah Hex stuttering and stammering that there has been a misunderstanding, he thought this was a boarding house of some sort. Inside, we see Hex at the front desk still trying to sort things out but in the background there is a man getting a massage and reading the crawl-sheet that has a huge story about Hex defeating the Shooting Gallery. Suddenly the folks we saw earlier burst into the building shouting "PIGS!! WALLOWING IN SIN!!!" and then open fire with tommy-guns and submachine guns. Jonah grabs a woman and dives behind the front desk with her and then grabs some cover. He whips out his pistol and is about to start leveling the playing field but the massage customer shouts for him to hold his fire. The man doesn't want Hex to hit his daughter, one of the folks shooting up the place. There is a pause in the gunfire and the shootists smile, stating that Maxwell Grogan will be proud of the souls that have been redeemed here. Oddly enough, the shooters are all dressed in 1930's garb. They leave with the phrase "The wages of sin are death and more death." Meanwhile, back at the Needle, (remember that?) Reinhold Borsten, whom we thought was dead, appears to only be mostly dead! We find him crawling through the wreckage, hideously disfigured and near death, but still vowing vengeance on Jonah Hex. 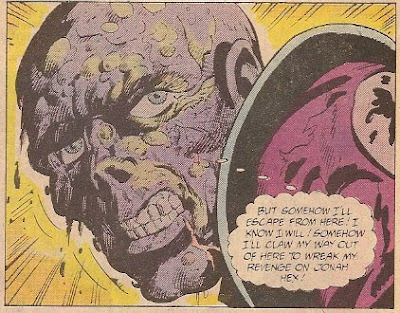 Of course, we go back to find that Jonah Hex has accepted a ride and dinner from the man in the "inn", named, uh, well. We never learn his name. Get over that! Anyway, turns out his daughter has gotten mixed up in a anti-sin cult that worships a mass murderer from the 30's The guy hires Hex to bring back his daughter but is at least able to tell Hex that the bunch works out of an abandoned shopping mall north of town. Jonah heads out to the mall, considering that this is getting him some money but it's not getting him any closer to finding Stiletta. Just then he glances up in the sky and sees a cross-over sales boost! That's right, it's a Legion of Super-Heroes time bubble in a surprise cameo (it's a surprise because they told you that right on the cover! SUPRISE!) with Element Lad, Dawnstar, Superboy, and Shadow Lass. Seems the LSH got thrown of course and ended up in Jonah's book. Superboy grabs the Time Bubble and gets it back on track in the time stream but not before Jonah sees them and figures that he is drunker than he thought he was. Inside the shopping mall, we find that it is getting closer to GLORY TIME!!! The mall is crowded with the faithful followers of Maxwell Grogan, each of them dressed in the 1930's attire and the head priest is wearing a huge hat similar to that worn by the Grand Dragon of the KKK. Jonah Hex grabs a follower, turns out his lights and grabs the coat and hat and decides to find out what GLORY TIME!!! really is. Jonah ends up in a balcony of a movie theater where the preacher is showing a film of Max Grogan getting captured by police in 1931. The newsreel continues with Grogan walking the last mile to the chair and the preacher is shouting that they are in the very theater where Grogan was captured and they have that same electric chair and now followers will go to glory in that chair. 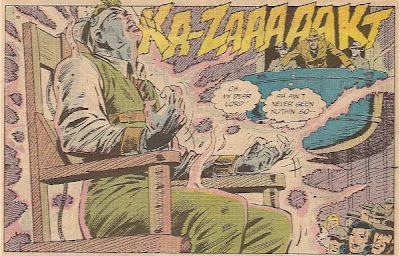 The first man walks up, gets strapped in and electrocuted to the shock and disgust of Jonah Hex. Hex decides ha can't wait any longer since the girl he was sent to recover in next in line. He jumps from the balcony to the stage, grabs the girl and takes off. In the lobby, he shoots the chandelier to stop two gangsters that are giving chase and then he tries to shove the girl up a stairway. Jonah is stunned to see that the stairs move, but not too stunned to shoot down more thugs. A couple of thugs decide to take a lift tube to the next floor but Jonah spies them and realizes one thing about the future, always shoot the controls. Of course, the gangsters fall to their death. 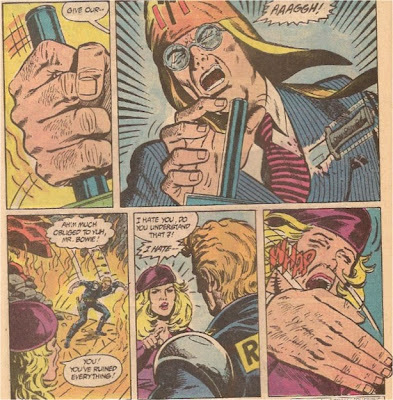 Jonah continues to shoot his way through the gangsters all the while the girl is trying to convert him to the teachings of Grogan. Finally Jonah has had enough and grabs the girl and jumps over a railing, landing atop a monorail. They get inside and Jonah starts pushing buttons to get the thing moving. Sadly, Jonah manages to jam the controls and the monorail can't take the first turn at top speed and flies off the rail and right through the side of the theater. The whole shooting match bursts into flames and the preacher screams for the girl to come to her glory. She jumps from the monorail and rushes for the chair. She straps herself in and the preacher is ready to throw the switch but Jonah comes to, grabs his pistols and finds they are empty. The preacher grabs the switch and just as he starts to throw it, a large knife ends up buried in his chest. Jonah jumps to the stage, slaps the girl unconscious, grabs her and makes tracks. Some time later, we see the father paying Jonah for the job and stating that he has locked her in her room upstairs. Just then we hear some loud crashing from the house and the father runs inside as Jonah rides off on his cycle. The father tops the stairs and finds his daughter's room empty, the window broken and a sheet hanging to the ground. The father starts shouting that Hex has to help find her but Jonah continues on. Just then we see three motorcycles dropping from the sky and opening fire on Jonah!!! Timeline - Hmm, this is tough. The Shooting Gallery is still in the news so it can't be too far after that so maybe my estimation of a week passing from two issues ago is probably wrong. Hmm. let's say three days between 8 and 9 and three days between 9 and 10. I did enjoy this issue, lots of gunfire, lots of death, lots of burning stuff. Add in the weird cult from the 1930's and it just sits correctly on the tongue. It also made me remember this little bit that I thought about two years ago. All except for the SURPRISE CROSSOVER SALES BUMP!!!! I could have really done without that. 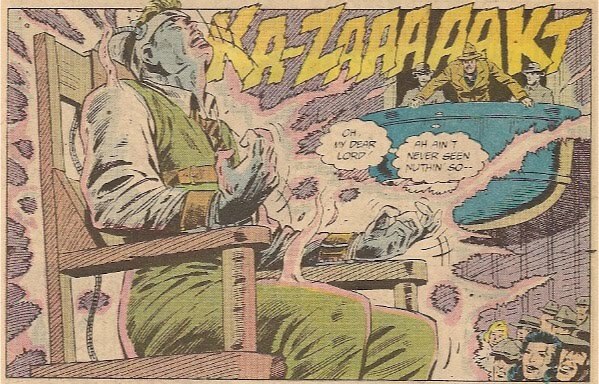 Now it means that I'll have to track down LSH #23 for one lousy panel of Jonah. grrrrr. I also didn't like the confusion that Jonah had regarding the whorehouse. His old west wasn't THAT lily-white. I think Fleisher overplayed the hick hayseed bit just a tad too much here. Next Issue: New York City!!!! Stiletta Found!!!! Jonah Hex vs. Batman!!! It's true!! The Damn BATMAN!! !